Status: Added select-screen “previews” to the levels that didn’t have them or where they had them but they looked wrong. Fixed a bunch of visual and controls glitching. Finally got to do some playtests and concluded that just literally no one notices the subtle glow that the “you are controlling this character” characters get, and the game is simply not playable if you can’t follow which square you’re controlling. 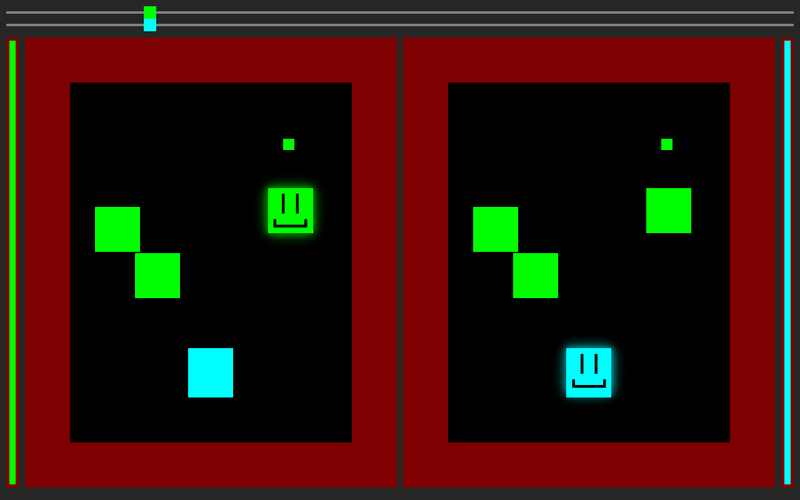 Gave in, said SCREW AESTHETIC PURITY and put big ugly smiley faces on the character you’re controlling. If you can’t keep track of who you’re controlling now, there is nothing more I can do for you. Oh, and I gave the game an icon. This will be the last update of this type, my post tomorrow will be my final submission to the compo. I don’t expect any further changes except a linux version and maybe a kill screen if OpenGL 2 is not present– I’m hoping to spend my time tomorrow doing as little coding as possible and ideally making, like. A HOW TO PLAY graphic or something. I hope you have enjoyed this little 39-day tour of a creative process; maybe I will try this again sometime. Thanks for reading, and please remember to return your 3D glasses in the designated bins on the way out. This entry was posted on Sunday, February 27th, 2011 at 3:22 am	and is filed under The Snap. You can follow any responses to this entry through the RSS 2.0 feed. You can leave a response, or trackback from your own site. I eagerly await the launch of Duke Nukem 4D.